1. Start by drilling a hole through the bottom of each skull, that will be large enough to fit a small funnel into. 2. Next, spray paint each skull with 1-2 coats of your favorite color spray paint. Let paint dry in between coats. 3. Once dry, turn skulls over and fill with dry sand, using a funnel. To keep the sand contained, you may want to sit the skull upside-down in a large bowl before adding sand. 4. Next, it's time to spray paint (or stain, if you prefer), two pieces of scrap wood that are slightly larger than the skulls. Let paint (or stain) dry completely. 5. Next, seal up the hole on each skull with glue and wait for it to dry completely (overnight). Then, secure the skull to the base of each piece of wood with more glue. Let dry overnight before using. NOTE: After the skulls were finished, I realized that the blue color wasn't quite right. So, I removed the skulls from the wood and repainted them, this time in metallic gold. And the final results work much better with my style. 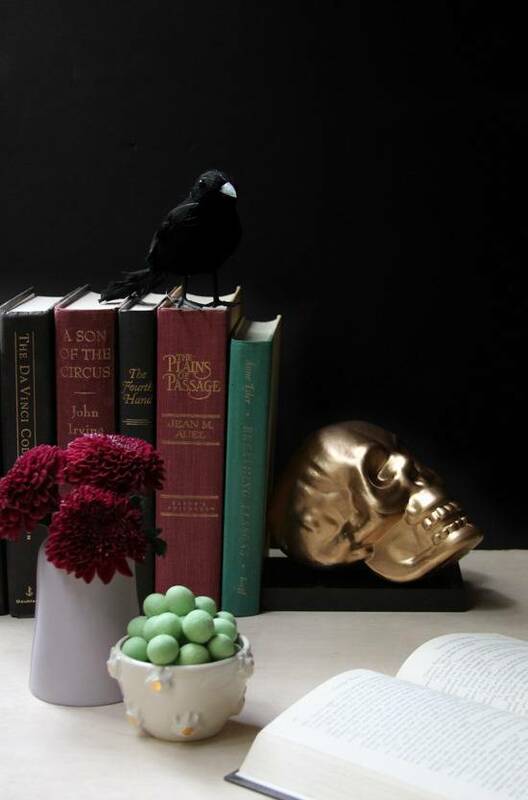 Depending on your decor and overall style, you may even be able to get away with using these skull bookends year round. Especially if you go the metallic route. How do you like to decorate for Halloween? Think you might give these bookends a try? Just to let you know, I loved this idea so much after I found it on Pinterest that I borrowed your idea and changed it a wee-bit. I posted it at my blog http://www.savvysydney.com/2014/10/diy-skull-bookend.html I did post a link to this post and mentioned the fact that I found the original idea on your blog as well. Thank you for the wonderful idea! Happy holidays. Very Poeish of you. Well done! These are awesome! Totally love the styling too!